Carp caught at Utah Lake. Carp are an often undervalued sport and food fish. They have deep, thick body color is gray to brassy green or yellowish green. The body is	normally covered with very large scales, and carp have fleshy barbels on each side of the mouth. A large spine is present at the	front of the dorsal (top) fin. Use worms, dough balls, or other bait and fish on the bottom. 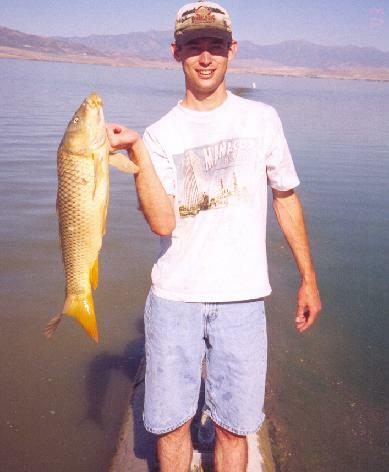 Carp will give you a good fight, grow to a large size, and can be tasty when smoked, according to the Utah DWR. There is no limit on how many carp you can keep. Common Carp are a nuisance fish in many Utah waters, and considered a 'trash fish' by many Utah anglers. Carp can provide lots of fishing fun, and are also great catfish bait! They are not protected wildlife, and there is no limit on how many you can keep. Many Utah anglers catch carp and use them for bait when fishing at Utah Lake	for Channel Catfish, White Bass, or Walleye. Many people use pitchforks, spears, bows, and other means to catch and kill carp. This happens most often when the carp are most vulnerable, during the spawn in early to late spring. During this time, carp inundate the shallows and splash around at or near the surface in water sometimes not any deeper than they are tall. Besides bait, other beneficial uses of carp are fertilizer for your garden, pickled carp (sort of like canned tunafish), or smoked carp (fish jerky). Supposedly carp get a bad rap as a trash fish, and if prepared right can actually taste pretty good. I'll leave that for you to decide, but for me, I'll just stick to using them for bait though! No limit. Any with a valid Utah fishing license can keep as many as they would like. It is not permitted to leave dead fish littering the banks. Spearfishig for carp in the Provo River is prohibited to protect the June Sucker, an endangered species. Carp are more vegetarian than carnivorous, however they seem to eat just about anything. Some good baits for carp include nightcrawlers, bread, doughballs and I've heard of strange things like hot dogs or gummy bears. Personally, I tend to favor worms and bread or dough as my preferred carp bait. One tip, HOLD ON TO THAT POLE when fishing for carp. I have had a carp launch my 6 foot 'Ugly Stick' fishing pole right out into the lake when I wasn't paying any attention. Luckily, I was able to retrieve my pole from the water, but not before the huge fish had wrapped up my line in some stickups, causing me to lose the fish (but at least not my pole)!